Adam discusses two themes: 1) focus on the buyer and 2) a holistic view of a sustainable operational process. These are driven by a greater shift in buyers approach to selection. He then illustrates how/why successful companies need to match relevant content marketing with effective lead management to deliver the right message at the right time. This intersection is described as Demand Process Integration. A siloed approach of evaluating success in demand management is no longer viable. Instead, it requires evaluating and tweaking the entire pipeline (incoming channels, data integrity, progressive profiling, nurturing) and valves (scoring, routing). More Than Just the Technology – Marketing/Sales technology sometimes do not live up to their ROI. Sure there are always bugs in technology, however we’ve see companies push forward with success Why? People, process and content need to be part of the equation. Don’t be afraid to look for help through an agency, consultancy or hire an expert. Investing in these types of relationships can yield time and revenue dividends over time. Data, Data, Data – If you find data to be boring, then go hire someone who loves it. Marketing rocks today because data drives everything from lead generation, prospect nurturing and customer feedback. Understanding the personas of your buyers and collecting the information behind them will help you deliver resonating material. About the Individual – Adam goes through a nice background on the changing B2B marketing approach. It further supports that marketers need to focus not the traditional firmographics of an organization, but the individuals that it comprises. 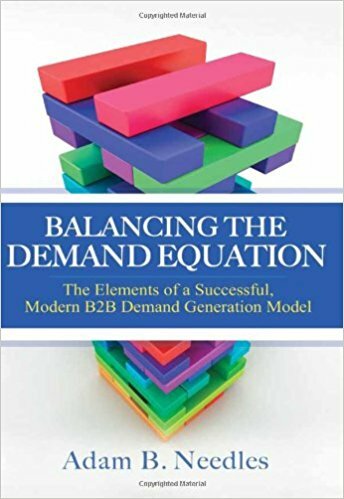 For new B2B marketers, Balancing the Demand Equation is great resource on the background on buyer shifts and provide a how to approach lead management. For a veteran, the book articulates and supports, through lots of supporting research, many of the ideas you know that were nagging you, but you were too busy playing the role of an octopus. Balancing the Demand Equation is a great read and chock full of resources from thought leaders and research in the space. I highly encourage you to get a copy.